Tierra Chamahua Eco Adventures begins a new concept in guest ranches through Rancho Los Baños. This development caters to individuals seeking adventure, challenge, relaxation and thrills in conjunction with and respect for the outdoors. Whether through rest and relaxation, trekking, hiking, thermal springs, canoeing/kayaking, lake tours, birding, jeep tours, mountain biking, horseback riding, wildlife observation, camping, and such nighttime activities as stargazing and wildlife safaris via night vision, Tierra Chamahua Eco Adventures endeavors to always provide great thrills, adventures and respect for the outdoors. 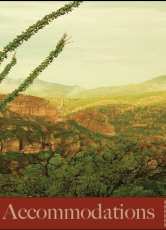 What we offer is Nature at its very finest, located at the intersection of two of the world's great deserts, the Sonoran and Chihuahuan, a land of immense beauty and scenery, with an opportunity to see many protected habitats, mammals, birds, flora and vistas. With a wild ruggedness that makes this part of the world one of the last frontiers left in the Americas, this land, private, isolated and serene, untouched and unspoiled, with no sign of humanity for miles, will take your breath away. It will radically alter your idea of what a desert environment is. Indeed, there is no desert environment in the USA quite like this one. For a few days, we hope Rancho Los Baños becomes your playground and your adventure, whether you come to rest or play. Tierra Chamahua Eco Adventures strives to maintain a balance between guests and Nature, with an emphasis on returning our guests to a natural world long since forgotten, a world of immense beauty and peace. With humanity encroaching on pristine, unspoiled land more and more each passing year, the opportunities to experience the natural world as it used to be are dwindling. Through Rancho Los Baños we hope to showcase the beauty of this world we see less and less each year, in the process focusing conservation efforts to protect this vitally important region. Rancho Los Baños, situated 60 miles south of southeast Arizona in northeastern Sonora state, is located at the foothills of the Sierra Madre, with a range in elevation from 7,400 feet above sea level in the northern border, at the top of El Pinito mountain, to 3,200 feet in the southern canyon country, which includes breathtaking El Cajon Canyon. Its 30,000 acres, which includes 5,000 acres from El Cumaral, our neighbor to the east, makes it one of the larger ranches in all of Northern Mexico. The terrain and topography of the ranch is rugged and wild, full of canyons, cliffs, vertical sierras and rocky river beds. Often called "some of the wildest country you will ever see,"  Rancho Los Baños got its name from the thermal hot springs that exist inside the ranch. Meaning "The Baths," Los Baños has roughly 35 natural springs within its borders, making this Sonoran/Chihuahuan Desert landscape home to numerous flora and fauna, some of which can only be found here. Within the borders of the ranch are myriad numbers of diverse habitats corresponding to elevation, topography and temperatures. Along with this, the ranch is home to an incredible array of both flora and fauna, large and small, predator and prey. As a protected wildlife sanctuary, the ranch is home to a great collection of mammals, birds and vegetation. Sections of the ranch are mountain lion country, with large numbers of cats thriving in their environs. The ranch also has many bobcats, ocelot, ring-tail cat, foxes, coyotes and a small number of black bear in the higher elevations. The occasional jaguar migrates through the ranch as well. The ranch is home to many white-tail coues deer, javelina, Gould's turkey, chulos or coatimundi and smaller mammals such as skunk and squirrel. Our canyons, always water-filled,are homes to many of our birds and mammals. The new generation is American raised and educated, at one time having called Boston, Chicago, San Francisco, Portland, Oregon, Phoenix and Barcelona, Spain home. They are both bilingual and bicultural, having previously worked as marketing executives, business managers, in human resources, education and the law. Over the years, the Valenzuelas' have successfully managed the ranch through thick and thin, drought and abundance, helping make the ranch one of the most successful ranching enterprises in Sonora. The family's deep seated belief in living with nature and not at its expense has helped preserve this enchanting land much the same way as it has been for thousands of years. Our Team consists of a collection of family, genuine and real vaqueros, chefs, handymen and European [England, Croatia], American [Minnesota, California] and South American [Colombia] wranglers, hostesses and guides that, together, help make your stay with us a memorable, relaxing and thrilling experience. We are a tight-knit group that strives to provide great hospitality and top-notch service. Tierra Chamahua EcoAdventures derives its name and inspiration from the language and culture of the Native Americans who made Rancho Los Baños their home thousands of years before the arrival of Europeans. Our EcoAdventures outfitter, Tierra Chamahua, was named in honor of these Native Americans, those we in Sonora call the Opata. The word Chamahua, meaning "from which all things flow" is the name of the Opata's principle belief system, described further below. Combined with the Spanish word for land, Tierra, we feel this name, and philosophy, represents the vision and goal we at Rancho Los Baños endeavor to perfect. Guest ranches accommodation in Mexico. It is our love of the outdoors, and our wish to share it with all who want to come, that makes Rancho Los Baños an active beacon in the "land from which all things flow". Our desire to share this beautiful land, combined with wishing to pay our humble respects to the ancients that once inhabited this land, both in language and visual imagery, has led to the creation of Tierra Chamahua Eco Adventures, as well as incorporation of a 2,000 year old petroglyph into our logo. This glyph, now logo, an image of Opata "wing people," represents the deep respect we have for an ancient nomadic people whose lives were defined within the boxed canyons of the ranch. Little is known of their history at the ranch, yet it is they who left an indelible imprint on cave walls, showing us, even if it is but a small glimmer, a brief representation of what life and culture surely must have been like for these tribes. It is they who first saw the wonders and beauty of this land, and it is they who first thrived here, living and dying among the canyons and rugged topography that defines the ranch. In their 2,000 year-old masterpieces painted on cave walls their spirit can be felt and understood. Since their time, much of the ranch has remained as it was 2,000 years ago, unchanged, unspoiled, undisturbed and untamed. Your eyes will see what the ancients saw. You will feel and smell what they felt and smelled. It is safe to say, then, that perhaps the land that time forgot will take you back in time to a world no longer seen, a world of mystery, magic and unsurpassed beauty, a world devoid of modern life. Tierra Chamahua, then, is the land from which all things flow, a bridge to the past, a respect for ancients, a highway to the future and an understanding of interconnectedness and balance in a world that lacks both. highest quality accommodation at affordable prices.